A habit forming collection of photographs, taken from the window in front of my desk. 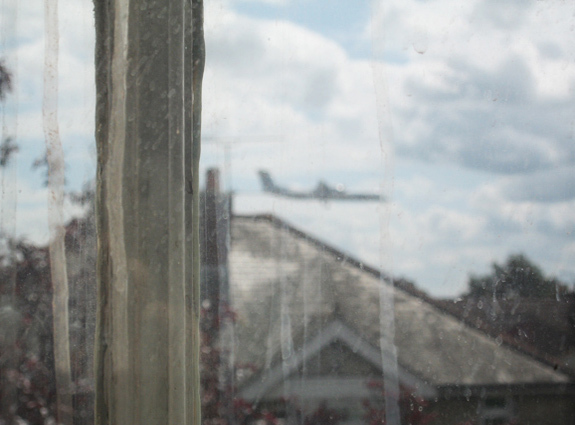 The flight approach path of Southampton Airport runs parallel to this window. The images are scheduled by ear: on hearing the sound of an approaching plane, I attempt to synchronise its photopgraphic arrival within the frames of the windowpane and my audition. Due to weather conditions, the direction of the flight path changes from one of arrival to one of departure. In a form of visual counterpoint, a companion series of images, applies the same process to synchronise these photographic departures.